I’m often asked how we distribute diapers, so I made a video while I was distributing today to give an idea of how we work. Big thanks to the representatives from our partner agencies that agreed to go on camera for me! Many of you have heard me give shout-outs to Bruce Will over the last 2 1/2 years, he was one of the first people who noticed, “got” and dedicated himself to supporting our community Diaper Bank and he’s been THE go-to guy for me since the summer of ’09. 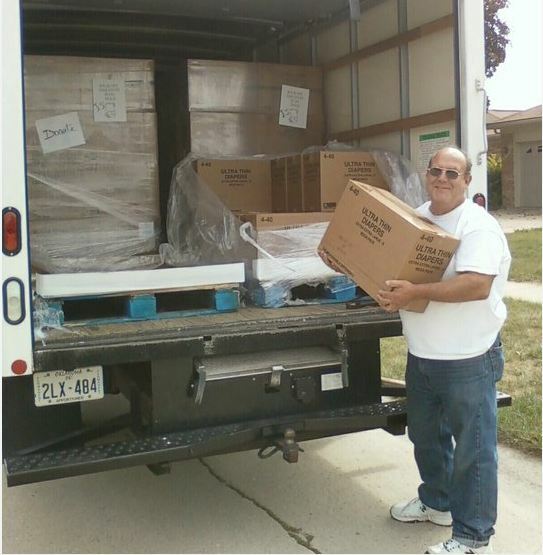 Bruce not only helped secure this donation of 27,000 diapers for the Diaper Bank, he also rented a moving truck himself, picked up and delivered them! Talk about above and beyond! Bruce is a Ford retiree who, instead of filling his time with golf or other recreational activities, has been involved with and looked for volunteering opportunities. When we met, he’d been a dedicated volunteer with a large charity and spent every Wednesday helping them downtown for the past 8 years. When Steve described the Diaper Bank, Bruce had the lightbulb moment – the same one I had back in Tucson, Arizona, almost 12 years ago when I first learned about diaper need and what a Diaper Bank is. He told Steve he’d love to help and gave him his number to pass on to me. When I heard the story, I was touched by his reaction but honestly didn’t know how I could involve him, we were still so young and just getting started. Just a few days later, I found myself in a “double-booked” situation — I was supposed to drop diapers off somewhere in Oakland County at the same time I was due to pick up some diapers downtown. I remembered that Bruce said that he went to Detroit on Wednesdays, so I called and asked if he’d be able to help me with the pick-up. He said he’d be happy to, he seemed to love it, and everyone he was in contact with loved him too. And a beautiful friendship was born – Bruce has done so much to help over the last few years, from picking up and dropping off donations, to securing a huge donation of diapers for us during our 2nd fall diaper drive, to helping lug and move and re-move diapers, to storing diapers and collection bins for us in his own garage, … I really don’t know how we would have done what we’ve been able to do the last 2.5 years without him. The Diaper Bank’s growing quickly, Bruce’s commitment remains strong, thankfully, and he’s recently been able to dedicate even more time to us, which is beyond fantastic. So I’m thrilled to now introduce Bruce in a more formal capacity with the Detroit Area Diaper Bank, he has taken on the role of Diaper Collection Coordinator (“The Pick-Up Artist” was a title in contention at one point, but we feared it might be construed the wrong way…), and he will now take on all front-line communication and coordination for any donation pickups that need to be made across Metro Detroit. He will also be the point of contact for our donation dropoff locations and make it possible to grow the number of dropoff locations we have available. We also want to build a network of volunteers that Bruce will be able to call upon and coordinate with as pick-up requests overlap or are in locations that are not convenient to where Bruce may be at a particular place or time. So we’ve started a Google Group to create an email list that Bruce and I can post to when various volunteer opportunities crop up (not limited to just donation pickups, we will also turn to the email list first when we need volunteers for events or if we need spot-help with things like sorting and re-packaging loose diapers, etc.). Thank you, Bruce, for taking the lead on what is a major piece of our Diaper Bank puzzle – it will relieve so much off my plate in terms of where I need to split my time, and our donors, our partner agencies, and interested volunteers will all be served better for it. Please join me in thanking and welcoming The Detroit Area Diaper Bank’s new Diaper Collection Coordinator, Bruce Will! I was chatting with Sharon Daniels from one of our recipient partner agencies the last time she came to pick up diapers and somehow during the conversation it came up that she makes her own baby wipes. Though her daughter is way past the diaper stage, she still makes them for family camping trips, to keep in the car to refresh hands, wipe things up, etc. She also said recommends the ‘recipe’ to families she gives diapers to and I thought that sounded like a great idea. Inspired, I asked her for the directions so I could try them out and also share with our other partners and anyone else who might come to us that needs wipes. Step 2: Add the baby wash and baby lotion to 2 Cups of boiling water in the container and whisk it all together. I have the Kroger brand of baby bath and the Target brand of baby lotion on hand – any can be used. If your child is allergic to perfumes and you need to use unscented, keep an eye out for mold if the wipes sit around too long. I read one article about homemade wipes that said they think that the alcohol content in the perfumed baby bath is probably what helps keep mold at bay. If you make a huge batch and don’t use them quickly, make sure to keep an eye on them and throw them away if they sit too long and show signs of molding. Step 3: Place half the roll of paper towels in the container and put the lid on, then shake. If the top pops, keep putting it back on and keep shaking. Then turn the bowl upside down and leave for a couple of hours, checking in and shaking it now and again. Step 4: Flip bowl back over and remove the cardboard tube from the center of the roll. Pull individual towels out and you have baby wipes! As you can see below, I tore individual sheets and laid 50 of them in an old wipes container I still have to see if I could access and use them like I used to use baby wipes when the kids were small; I also made a pile of 25, folded them in half and put them in a small ziploc to keep in my purse; and then made a pile of 40 and put them in a large ziploc bag to keep in the car or van. So counting the ones I used first to try them out, I got ~120 usable baby wipes from just that 1/2 (1/3) tube. I have the other 1/2 soaking now, and I turned it sideways into a different bowl with lid so I didn’t have to cut that one down. I should get at least another 120 wipes from that 1/2 (and they’ll be slightly larger than the first set), so that means I’ll get ~240 baby wipes out of just one roll of paper towels and a few tablespoons of baby wash and lotion I already had on hand. And the final test – I gave each of the boys a wipe to try — they gave them very high marks! They all thought they felt good, felt like a baby wipe and like how they smell. So that REALLY makes them a success – I highly recommend this ‘recipe’, will be sharing it with our partners and will make the information available on our website, hoping that anyone that comes to our site looking for help with diapers might find this useful as well. I THANK Sharon for the inspiration and instructions. And boy, do I wish I knew about this when my kids were still in diapers! Maggie, 86, has lived in her home in Warren for the last 35+ years and still takes care of herself. She has a son nearby who checks on her and helps her out, but the only other support she receives is Meals on Wheels. She lives entirely off of her Social Security check, which she said barely, and often doesn’t, stretch the whole month. So Maggie usually stays home. “It’s not as big a deal if I have an accident around here,” she says. She keeps one diaper her neighbor gave her in a drawer, waiting for the day she has to go to her doctor appointments. Maggie was positively effusive about how fantastic the diaper was – the last one she wore “fit her like a glove”, it didn’t leak, it was comfortable, and she wasn’t worried about having an accident. You’d think adult diapers were a brand new thing on the market, listening to her go on about them. But to Maggie, they’re a luxury. They’re expensive and she can’t get out easily to get them. After reading this article in the Warren Weekly, Maggie called both the article author and me, asking about the Diaper Bank and explaining her situation. “I just thought I’d give it a try and see if this might be what could get me some help. It just seemed like such a blessing,” Maggie told me. Thanks to all of our generous donors and supporters, the Detroit Area Diaper Bank can help make sure Maggie has access to the basic hygiene items she needs to be more comfortable both at home and when she leaves the house. Dignity. Independence. Health. Security. Confidence. Aren’t those the things that everyone in their golden years deserve? Aren’t those the things we all want? Helping wonderful neighbors like Maggie is exactly why the Detroit Area Diaper Bank exists. Maggie could not have been more touched, thrilled or grateful. Thank you to everyone who supports us, encourages us and helps us make a difference with diapers! The Detroit Area Diaper Bank, Inc.
CANTON, MICH. (August 1, 2011) – The Detroit Area Diaper Bank, a Canton-based nonprofit charity providing diapers for people in need in Southeast Michigan, launches its 3rd Annual Fall Diaper Drive today. The Diaper Drive’s goal is to collect 200,000 diapers (or the funds to buy them) by Thanksgiving 2011. No federal assistance programs pay for or provide diapers, not WIC, Food Stamps or Medicare. Nonprofit organizations and state agencies working with families and individuals in crisis consistently list diapers as an ongoing and TOP need. An average infant uses up to 12 diapers per day, a toddler up to 8 per day. But in low-income households, a baby may be in a single diaper all day or longer, increasing the chance of health problems and putting the child at risk for abuse. Parents who can’t afford diapers can’t leave their child at daycare to go to work or school. Some children with disabilities never outgrow the need for diapers and seniors who can’t afford incontinence supplies often become home-bound or end up in a nursing home. The Detroit Area Diaper Bank exists to address this largely unknown and chronically unmet need; the Annual Fall Diaper Drive helps drive donations into the Diaper Bank so that it can fulfill more of its partner agencies’ families’ needs and be able to help through the holidays and start of the new year, a time when donations tend to slow down. The Detroit Area Diaper Bank’s mission is to raise awareness about the large hole in the “safety net” resulting in the unmet need for diapers in our community’s most vulnerable populations — babies from low-income households, the elderly, people with disabilities — and build a network to help meet it. For more information, please visit www.detroitareadiaperbank.org. The Detroit Area Diaper Bank was a 501c3 charity that provided diapers to nonprofit organizations in Southeast Michigan from 2009-2014. No federal assistance programs pay for or provide diapers, not WIC, Food Stamps or Medicare. Diapers are a huge hole in the "safety net" for our youngest and oldest neighbors in need. Please continue to donate and make a difference with diapers in Metro Detroit!